T’was the night before the 2015 NBA Draft and all through the league GM’s were aghast… at the uncertainty of the talent and who they should pick. While many believe that the top two selections: Karl Anthony-Towns and Jalil Okafor are no-brainers, the rest of the lottery isn’t as clear. Allan: Karl Anthony-Towns C University of Kentucky– Minnesota has the ability to upgrade their front line and Towns will be able to defend the rim and rebound. He’s not the most refined offensive big man in the draft but if developed he can become a true throwback dominant big man. Quinne: Karl Anthony-Towns C University of Kentucky – This may be the only sure-fire pick in the draft tomorrow and there still are reports that Minnesota isn’t 100% sold on the big man from Kentucky. I don’t know why… he has the best combination of size, ability and potential. This is a home run pick for the Timberwolves and if they don’t pick him, they will regret it. Allan: D’Angelo Russell G Ohio St. University- A lot of Lakers fans would love to see an Okafor/Randle frontcourt, but they are too much alike and would be a defensive liability. Russell will help the Lakers with their struggling offensive and give Kobe a scoring option he can trust in the backcourt. Allan: Emmanuel Mudiay G China – A perfect fit for a team without a true leader and player to fear offensively. Based on his film he will upgrade his teammates play and will hopefully keep Philly from being the laughing stock of the league. Quinne: D’Angelo Russell G Ohio St. University- Despite the reports that Russell doesn’t want to play for Philly the 76ers cant afford to pass on the player many consider the most talented in the draft. He has the size and ability to rescue the fans in the City of Brotherly love from wanting to choke everyone in the 76ers organization who has contributed to this tanking mentality. Allan: Jahlil Okafor C Duke University- Phil Jackson gets his first break as the President of the Knicks and gets a centerpiece that may make Melo think twice about demanding a trade. This is still a rebuild year, but may entice a 2nd level free agent with this pick. Quinne: Emmanuel Mudiay G China- While many Knicks fans will be upset that neither big man slid to them, they will be happy with this consolation prize. Mudiay is a terror with the ball and could fit well in the triangle. Having Derek Fisher as his coach will ease the transition of the young guard who despite only playing a handful of games overseas is more prepared for the full experience of being a NBA star than some of his fellow rookies. Allan: Kristaps Porzingis-PF/C Latvia The classic European stretch 4 who can shoot the 3. He may be the missing piece to take the pressure off Victor Oladipo and open up the entire offense creating mix matches on both sides of the court. Quinne: Justise Winslow SF Duke- Depending on what happens with restricted free-agent Tobias Harris, the Magic and new head coach Scott Skiles may have to fill a hole at the small forward position. Even if they re-sign Harris, Winslow provides more athleticism to go along with SG Victor Oladipo and gives them flexibility with the rotation. But as with Oladipo, Winslow is still refining his outside shot but that can be fixed once he gets to O-Town. Allan: Willie Cauley-Stein PF University of Kentucky– The creation of a Wildcat frontcourt could be a blessing and calm the choppy waters in Sac-town. Cousins may overlook the snub by his new coach and become an even better player. Quinne: Kristaps Porzingis- PF/C Latvia With there being plenty of rumors about the Kings wanting to deal talented but frustrating big man DeMarcus Cousins, the selection of Porzingis not only gives Sacramento protection if some how the trade takes place. Kristaps is also a guy that could compliment “Boogie” if he stays in Sac-town. While talented, Porzingis frail size has him as this draft’s poster child for foreign-born boom/bust selection and that scares people. Allan: Mario Hezonja SF Croatia- A big guard who can stroke it is exactly what Denver needs to balance their offense. His size will put pressure on the opponents and his ability to shoot the 3 will make him a better passer. Quinne: Mario Hezonja SF Croatia- Talent isnt the question with the talented shooting guard, its whether his limited production will translate successfully into a NBA game that will expect him to produce in 30+ minutes nightly and not sporadically like he did in the Euro league. Allan: Justise Winslow SF Duke University- Finally the right player at the right position for Detroit with the versatility that head coach Stan Van Gundy loves on the wing. He will be a starter from day 1 and has the ability to develop into an excellent defender. Quinne: Stanley Johnson SF Arizona University- The Pistons fans once again have to deal with disappointment as their top two choices, Winslow and Hezonja, are already off the board. The consolation prize is the forward out of Arizona. While he wont wow you with athleticism like Winslow, he will find a way to get the job done and that’s more than what Detroit has gotten out of that position the last couple of seasons. Allan: Stanley Johnson SF Arizona University- The recent trade made room for a scorer like Johnson. Giving Kemba a true running mate will allow this team to gel much sooner than most think. Quinne: Trey Lyles PF University of Kentucky- The recent acquisitions of Jeremy Lamb and Nic Batum give the Hornets some veteran talent at thin positions and will allow them to take a guy in Lyles that has plenty of upside despite not having a true position. Allan: Sam Dekker SF University of Wisconsin- The ability to shoot the 3 as well as drive to the hole is why he fits well in Miami. Spreading the floor should not be a problem with hybrid forwards in Dekker and Bosh; question is will D-Wade be there to enjoy the new found wealth. Quinne: Devin Booker SG University of Kentucky- With Dwyane Wade being in the twilight of his career and the uncertainty of his return the Heat need someone who can step in at the position. While he was exclusively an outside shooter his one year in Lexington, Booker possesses the size, 6’6, to be able to create havoc throughout the court. Allan: Devin Booker SG University of Kentucky- The need for a spot up shooter drives Indiana to go for a shooter rather than down low. The upgrade of Booker will allow for some great matchups offensively even a 3 guard rotation at times w/Hill and George. Quinne; Willie Cauley Stein PF/C University of Kentucky- Willie “Trill” gives the Pacers an energetic defensive stopper that could step in for Roy Hibbert as it looks like Larry Bird is regretting giving the big man out of Georgetown all that money. And while “WCS” lacks a true offensive game, Indiana has enough help with the return of Paul George. Allan: Trey Lyles PF Univeristy of Kentucky- This pick saves the guard tandem momentarily, but also provides versatility down low. Lyles can knock down the mid-range shot and bang with the giants. Quinne: Myles Turner PF University of Texas- I had high hopes out of Turner for his freshman year and while he didn’t live up to expectations, he has the size and potential to translate better on the next level. Having emerging big man Rudy Gorbert should help his transition into the league as well. Allan: Frank Kaminski PF/C University of Wisconsin- The heart and soul of the Badgers will come in a fill a much needed hole for Phoenix. He steps in and provides a little something extra that his fellow frontcourt teammates don’t and they will reap the benefit. Quinne: Bobby Portis PF University of Arkansas- Phoenix has a bunch of similar pieces at every position and the selection of Portis gives them another big body that loves to drift outside at times. 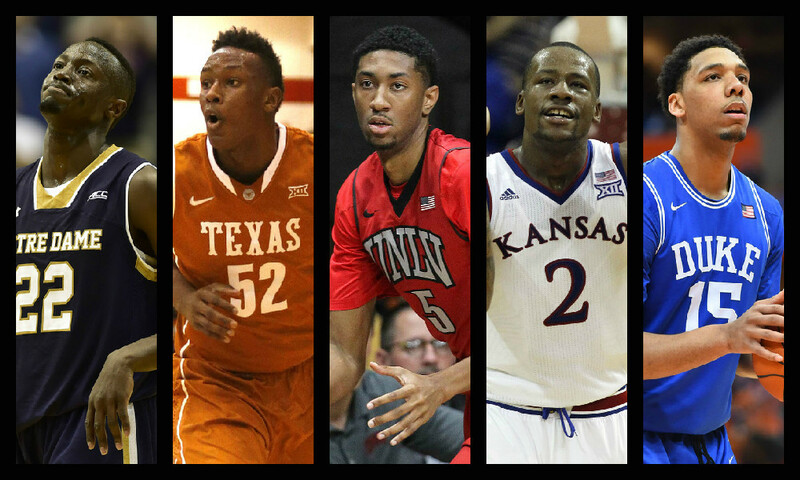 This selection puts the Morris twins and second year man TJ Warren on notice that no spot is safe in the rotation. Allan: Rondae Hollis-Jefferson F University of Arizona- The ability to pick for need and not talent is a luxury while still being in the lottery. A solid defender who doesn’t need to start will provide depth and rotation guy who will be expected make big defensive stops. Quinne: Cameron Payne PG Murray St. University- As Al said this is a luxury pick for the Thunder who hope to get back into championship contention in 2015. Payne gives new head coach Billy Donovan the flexibility to slide Russell Westbrook over to the shooting guard position, and could also serve as an insurance policy in case Westbrook bolts in free agency in 2017. Now we all know with the right, or wrong trade depending on who the team is, all of these predictions could go out the window so be sure to tune into next weeks episode of the “Sports Q&A Show” to hear the excuses Al and Quinne give as to why their selections were totally off.